We are working on a home in Palm Beach, Florida. It’s been an extremely interesting and complicated process. From approvals to design, there have been surprises at every turn. The building will house our client’s extensive art collection and meet the demands for air quality, temperature and humidity required by public museums. The site runs from the Atlantic Ocean to the intercostal waterway-so the conditions are challenging. It is certainly not your average residential project. Working with NY Engineers we have designed a high performance HVAC system to manage the indoor air quality, temperature, and humidity. We have also sought expert advice from glazing consultants to select the best high performance glass to make the building as energy efficient as possible. Large over hangs also shield the building during the hottest times of the day to reduce solar heat gain. But all of that is only part of our strategy to get the project to net zero—or in other words, to produce the same of amount of energy the house consumes. It’s a large home, with some 30,000 square feet of conditioned space. So to bring the project to zero, photovoltaics are planned to be the hero of the story. You may have heard that it is not possible for solar to replace fossil fuels, but technology is moving us closer every day—even on such a large building. 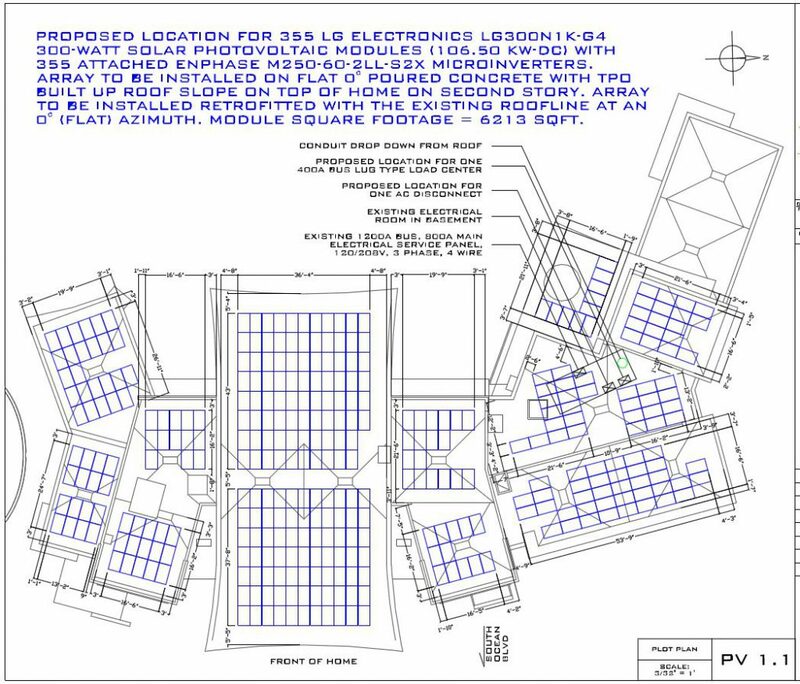 Because of the large expanse of roof area on the residence, we are able to have an array of panels substantial enough to produce roughly the same amount of energy the house consumes. It is really amazing—but there is a catch: Solar panels only make electricity when the sun is shining. The approach most home owners take to achieve Net Zero is to produce more energy than can be consumed during daylight hours. The energy leftover is transferred back to the grid for neighbors and businesses to use—ultimately reducing the amount of fossil fuel burned. This is called net metering. The excess power is sold back to the grid and the homeowner would receive a credit. At night, when the panels are not generating power, the owners use their credits to buy power from the grid. It’s a wonderful system—especially on hot summer days when the electrical grids are taxed the most by high consumption due to air conditioning. The problem: just this year, the state of Florida passed a law to allow “net metering”. But nearly as soon as the law was passed, big energy companies started fighting this law and have since proposed a constitutional amendment to prevent people from net metering. This is outrageous. It discourages people from using solar and turning sunshine into clean, renewable energy. It is worded in a very confusing manner—intentionally, I surmise. Voting “yes” would appear to give Floridians the right to choose and operate solar panels on their homes. But in reality a “yes” vote is to eliminate net metering. Companies like Duke Power, Florida Power and Light and Koch Industries want Floridians to vote “Yes.” The reason is that a “Yes” vote ends the ability of electricity customers to feed excess solar energy onto the grids. The Big Power industry does not want individuals to make their own power as it will reduce their market share. Vote “NO” to defeat this measure and allow individuals to make solar power and share it with the grid. Florida is one of the best states in the country for producing solar power due to the number of consistent days of sunshine. It’s also one of the most vulnerable states facing rising oceans. 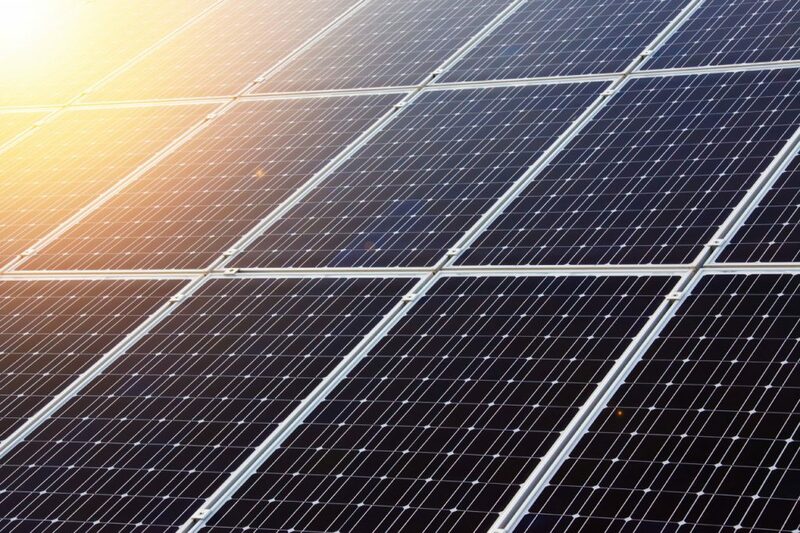 A vote “NO” will promote the use of solar power in Florida—a necessary move for our country.